William Carpenter, Principles of mental physiology, 1874, Appendix pp. 709-722. THE whole of the foregoing Treatise was in type, when the Writer became acquainted with the remarkable results of the Experimental Researches which have been recently prosecuted by Dr. Ferrier into the Functions of different parts of the Brain. * Of these results, some afford full confirmation of certain general doctrines set forth in the preceding pages, giving to those doctrines an unexpected definiteness and extension ; others are clear additions to our previous knowledge, which are not only important in themselves, but valuable as affording a clue to further inquiry ; whilst of others, again, the precise meaning seems at present obscure. As none of them, however, appear to the Writer in any way opposed to his previous teachings, he has thought it preferable, in the present stage of the inquiry, to leave these as they stand ; and to give a separate account of Dr. Ferrier's results, so far as they have yet been made public, with the conclusions which they at present seem to himself to justify. 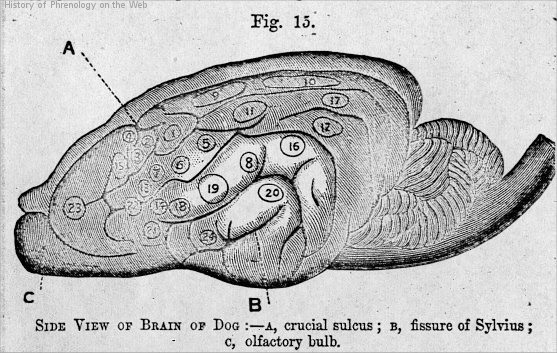 Dr. Ferrier's researches were made by the localized application of an Electric current to different parts of the Cortical substance of the Cerebrum, and, to other ganglionic centres forming part of the Brain-; the animal having been previously rendered insensible by Chloroform, so that the movements excited by this stimulation may be regarded as the direct products of the physical changes it induced. * Medical Reports of the West Riding Lunatic Asylum, vol. iii., 1873. 710 Appendix. Dr. Ferrier on the Brain. tip of the tongue; but very considerable variations in its tension were found necessary, in order to produce the same effects in different animals, and at different times in the same animal. These variations ' -were obviously related in part to the condition of the Blood-circulation : the excitability of the Nerve-centres being levered alike by the effect of the " shock " of the severe operation necessary to expose the brain to the requisite extent, -which enfeebles the action of the heart (§ 41) ; by the inevitable loss of Blood, which both directly diminishes the supply, and reduces the heart's action ; and also by the depressing influence of the continued administration of chloroform upon the heart's action. It thus came about, that after great haemorrhage, and -when the brain no longer showed the pulsation which marks the influx of successive waves of blood, the strongest faradization failed to stimulate. But, again, the excitability of the nerve-centres was further depressed by the direct influence of the chloroform ; though this seems to be much less strongly exerted upon the Motor, than it is upon the Sensorial centres. And, lastly, the excitability was progressively reduced by repeated stimulation ; so that at last no movement could be called forth, though the current was much increased in strength. Yet even then, after an intermission of the experiments, during which the use of the chloroform was suspended, and the powers of the animal were refreshed by food and by the respiration of pure air, the excitability was found to have been restored. This is obviously in full accordance with the principle stated in (§§ 404-2) ; for while the nutritive components of the blood supply the materials whereby the nerve-substance generates and repairs itself, audits "potential energy" accumulates, it is by the combination of the oxygen of the blood with those materials, that the potential is converted into actual energy (§308). points of the Cerebral surface at some distance from each other. This application excited either partial or general convulsion; the most severe fits being induced when the electrodes were applied at the greatest distance. Nothing, it must be obvious, could more strikingly illustrate the . principle, that while the ordinary Circulation suffices to keep up the nervous tension of the ganglionic centres to the point required for motorial discharge by automatic or volitional " closure of the circuit," the higher state of tension induced by hypermia is itself sufficient to produce spontaneous motorial discharges (§§ 308-311). 712 Appendix.Dr. Ferrier on the Brain. it acted directly upon the elements of the nerve-tissue, as in the galvanization of an ordinary nerve. The general characteristic of the Movements called forth by the local stimulation of the cortical substance of the Cerebrum, is that they are such as involve the co-ordination of several distinct muscular actions ; and resemble those which, in an animal in possession of its senses, we should regard as expressive of Ideas and Emotions. _ opening the month being in front of the under part of the fissure, while that which acts in closure of the jaws is more in the fissure. A similar series of experiments on Dogs gave results that closely accorded with the foregoing ; allowance being made for the somewhat different disposition of the convolutions, in accordance with the different habits of the animals, showing itself in the higher development of the centres for the paw in cats, and for the tail in dogs. of the more violent spasms, the animal held up its head, opened its eyes wide with the most animated expression, and wagged its tail in a fawning manner. The change was so striking, that I and those about me at first thought that the anima] had completely recovered from its stupor. But notwithstanding all attempts to call its attention by patting it and addressing it in soothing terms, it looked steadfastly in the distance with the same expression, and continued to wag its tail for a minute «r two, after which it suddenly relapse . into its previous state of narcotic stupor." The application of the electrodes to point 21 produced "drawing back of the head and opening of the mouth, with a feeble attempt at a cry or growl (the animal very much exhausted). Repeated applications of the electrodes to this point and its neighbourhood caused whining and growling noises," like those which a dog makes in its sleep, and which are supposed to indicate that it is dreaming. 714 Appendix.Dr. Ferrier on the Brain. considering the difficulty in exactly localizing the different centres, which arises from the absence of the landmarks afforded by the convolutions. It is curious that in this animal the centres of the mouth-movements seem to be the most highly developed; when- these (2, 7, Fig. 16) are faradized. " there are munching movements of the upper lip, and grinding of the jaws, as if the animal were eating vigorously." * See his Review of " Noble on the Brain and its Physiology," in the "British and Foreign Medical Review," for October, 1846.
instruments, not (as maintained by Phrenologists) of those passions and propensities which Man shares with the lower Animals, but of attributes peculiar to Man, which we fairly may suppose to consist in such Mental operations of a purely Intellectual character as do not express themselves in bodily action. Before considering the further conclusions to be drawn from the results of Dr. Perrier's experiments on the Cerebrum, it will be well to take into account those which he obtained from the application of the like stimulation to other ganglionic centres forming part of the Brain. When either of the Corpora Striata (§ 89) was thus excited to activity, an immediate and rigid pleurosthotonos, or bending of the body to one side, was excited in the opposite half of the body ; 'the head being made to approximate the tail, the muscles of the face and neck being thrown into rigid tonic spasm, and the fore and hind limbs fixed and rigidly flexed. Apparently every muscle or group of muscles represented in the convolutions, along with, the lateral muscles of the body, were stimulated to contraction from the corpus striatum ; the predominance of the flexors over the extensors, however, being very marked. Similar excitation of the Tlialami Oplici, on the other hand, gave no motor result whatever ; from which it may be concluded that they have no direct connection with movement. That the irritation did not call forth cries or other signs of pain, might be supposed equally conclusive against the idea that these ganglionic centres are instrumentally connected with sensation ; but when it is borne in mind, not only that the animal was under the influence of chloroform, but that the connection of the irritated Thalamus with the Cerebral centres of the movements which express pain had been destroyed in order to expose this ganglion, the absence of any such, expression seems adequately accounted for.Experiments on the Corpora Quadrigemina (or Optic Ganglia) were chiefly made on Rabbits, in which these centres are relatively very large and are easily exposed (§ 85). The application of the electrodes to the anterior tubercles immediately calls forth a violent opisthotonos, or backward flexure of the body ; so that, if the animal be not tied down, it executes a backward summersault which throws it off the table. The jaws are always violently clenched, and the pupils are dilated. These results do not militate against the idea of the connection of these ganglionic centres with the sense of Vision, which seems to be well established by other evidences ; but they show that they are also motor centres, especially for the extensor muscles. Stimulation of the posterior tubercles occasioned noises of various kinds. 716 Appendix.Dr. Ferrier on the Brain. unexpected conclusion that it is the ganglionic centre of the motor nerves of the Eye ; every kind of movement of the eye-balls,even rotation on their antero-posterior axes,being capable of excitation by stimulating some particular portion of the organ. The localization of the centres of combined movements of the two eyeballs in particular lobules of the Cerebellum in the Rabbit was extremely curious. Thus, when the electrodes were applied to the median lobe at point 1 (Fig. 17), "the right eye moved outwards, and the left inwards, in a horizontal plane;" at points 2 and 3, the "right eye moved inwards, and the left outwards, on the same horizontal plane. " Thus it appears that the middle lobe regulates those horizontal movements of the eyes which are harmonious but not symmetrical ; and that the upper part of the median lobe, and its middle and lower parts, are in functional antagonism. When the electrodes were applied to point 4 on the left lateral lobe, "the right eye moved downwards and outwards, the left eye upwards and inwards ; " and when the corresponding point of the right lateral lobe was stimulated, "the right eye moved upwards and inwards, and the left eye 'downwards and outwards ; " while conjoint irritation of both lateral points neutralizes both effects. When the middle division of the left lateral lobe was irritated at point 5, a downward movement of the right eye, and an upward movement of the left eye, were combined with a rotation of each globe on its antero-posterior axis, the left in the direction of the hands of a clock, the right in the contrary direction. But when the irritation was applied at point 6 to the lowest division of the left lateral lobe, the two eyes rotated on their antero-posterior axes in the same direction, contrary .to that of the hands of the clock, so that their vertical meridians retained their parallelism.This last action is what takes place automatically when we fix our gaze at any object, and- incline our head to the right side ; the rotation of the eyeballs in the opposite direction serving to keep the image of the object on the same spot of the retina, just as do the automatic movements of the eyeballs in the vertical or horizontal plane, when the head is moved upwards and downwards, or from side to side (§21). upon Pathological observation ; the doctrine of the Phrenologists, who regarded it as the organ of the generative instinct, having been long abandoned as untenable. But of the manner in which this power was exerted, nothing could be said to be precisely known. Now there can be no question as to the intimate relation between the guiding sensations we derive from Vision, and the co-ordination of oui1 ordinary movements of Locomotion (§ 192). In the affection termed "nystagmus," which consists in a restless motion of the eye-balls from side to side, there is a difficulty in maintaining the equilibrium ; and in the state called "locomotor ataxy," in which disease of the posterior columns cuts off the Cerebellum from its normal relation with the Spinal cord, it is impossible for the patient to maintain his equilibrium with his eyes shut (§ 80). So in the giddiness which most persons experience when they have rapidly turned round-and-round several times, it can scarcely be doubted that part at least of the result is occasioned by confusion of those visible perceptions, which would come through the oculo-motorial centres.That this regulation of the movements of the Eyes, and the harmonization with them of the general movements of the body, constitute the entire function of the Cerebellum, it would be premature yet to assert; but Dr. Ferrier's experiments seem clearly to establish the first of these, and strongly to indicate the second, as essential parts of its action. "We now return to the inquiry as to the import of the experimental results previously detailed, in regard to the localization of Cerebral action in the production of Movement, and its relation to Mental" states. In the first place, they unmistakably prove the correctness of the doctrine, that the Cerebrum, like the nerve-centres on which it is superposed, has a reflex action of its own ; which manifests itself in the production of co-ordinated movements, such as, in the normal condition of the animal, would be the expressions of Ideas and Emotions called forth by Sensations. The Cortical ganglion is ordinarily excited to activity by the nerve-force transmitted upwards along the ascending fibres from the Sensorium ;, this calls forth respondent physical changes in its substance, which changes excite the states of consciousness that we designate as Ideas and Emotions ; and respondent Movements are involuntarily called forth, which we regard as expressions of those states. The same movements are called forth (as in other instances) by stimulation applied to their motor centres ; which axe now proved to be definitely localized in the Cerebral convolutions. 718 Appendix.Dr. Ferrier on the Brain. But, secondly, it seems equally clear that these movements are called forth, not by the Mental states themselves, but by the Cerebral changes which are their physical antecedents. For we can scarcely believe that Ideas and Emotions can be- called up by faradization of the cortical substance, in animals completely stupefied by chloroform. And if -we attribute any of those "expressive" actions which are called forth by such localized stimulation, to the states of consciousness they would ordinarily represent,* we cannot refuse the like character to the Epileptic convulsion called forth by the more general stimulation ; a supposition at once disproved by the fact, that in the typical forms of Epilepsy, convulsive movements, such as have now been traced to "discharging lesions" of the Cerebrum.t take place without any] consciousness whatever. Viewed in this aspect, Dr. Ferrier's results obviously afford additional support to the doctrine of "Unconscious Cerebration;" by showing that important Cerebral modifications of which only the results make themselves known, may take place outside the " sphere of consciousness" (§§ 416-418). * Dr. Ferrier was himself so much impressed in one case by the intelligent character of the succession of actions thus called-forth, as to speak of it as "evidently an acted dream." But if this was, then every other must be regarded in the same light ; and the Writer fails to see in what the evidence of consciousness consists. It seems to him that it might just as well be said that the headless body of a Frog is animated by a directing Will, when one leg wipes off an irritant applied to the other (§ 67). f This view of the origin of those forms of Epilepsy which commence with convulsive spasm of the muscles ordinarily put in action voluntarily, is distinguished from those which primarily affect the muscles of Respiration whose centre of action is the Medulla Oblongata, is due to the clinical sagacity of Dr. Hughlings Jackson. centres of his Cerebrum, that, if we could stimulate those centres by Electricity, respondent movements of the kind acquired by such special training would be the result. And since we now seem justified in asserting that such movements may be executed unconsciously, we may further regard it as at any rate conceivable that they may be excited unconsciously, even though such excitement comes through one of the organs of Special Sense. The following statement recently made to the Writer by a gentleman of high intelligence, the Editor of a most important Provincial Newspaper, would be almost incredible, if cases somewhat similar were not already familiar to us : "I was formerly," he said, "a Exporter in the House of Commons ; and it several times happened to me, that having fallen asleep from sheer fatigue towards the end of a debate, I found, on awaking after a short interval of entire unconsciousness, that I had continued to note down correctly the speaker's words. I believe,'" he added, "that this is not an uncommon experience among Parliamentary Reporters." (Compare §§ 71, 194. )The reading aloud with correct emphasis and intonation,, or the performance of a piece of music, or (as in the case of Alberts-Smith) the recitation of a frequently-repeated composition, whilst the conscious mind is entirely engrossed in its own thoughts and feelings, may thus be accounted for without the supposition that the Mind is actively engaged in two different operations at the same moment ; which would seem tantamount to saying that there are two Egos in the same organism. 'But, fourthly, these results entirely harmonize with the view formerly expressed (§§23, 89), that the Cerebrum does not act immediately on the motor nerves, but that it plays downwards on the motor centres contained within the Axial Cord ; from which, and not from the Cerebral convolutions, the motor nerves take their real departure. For although either mechanical or electric stimulation of a motor nerve in any part of its course, of the motor columns of the Spinal Cord, or of the fibrous strands which constitute the upward prolongations of these into the corpora striata, calls forth muscular contractions, no such contractions were excited by the faradization of the fibres of which the medullary substance of the Cerebrum is composed, any more than by mechanical stimulation. And the fact that all the muscles concerned in the ordinary movements of the body can be thrown into contraction by stimulation of these lower centres,the extensors through the corpora quadrigemina, while the flexors predominated when the corpora striata were stimulated,seems to show that the office of the Cerebrum is not immediately to evoke, but to co-ordinate and direct the muscular contractions excited through these antagonistic primary centres ; just as it controls the Respiratory movements whose centre is in the medulla oblongata.
' But, sixthly, we have to inquire how far these experimental results justify the belief that there is any such localization of strictly mental states, as there is of the centres of the expression of those states in movement. And as to this it must be confessed that we are still very much in the dark,the only fact that seems to afford any clue to the solution of the mystery, being the apparent coincidence between the motor centre of the lips and tongue in the lower animals, and that region in the human Cerebrum of "which disease is so often found to be associated with Aphasia (§ 355). . This association, however, seems by no means so constant as to establish a causative relation between the Physical and the Psychical state ; and a careful examination of the phenomena of Aphasia would probably lead to the conclusion, that several distinct forms of disorder have been grouped under one designation. The typical Aphasia consists (as stated' in § 354), in the loss of the memory of words, or rather of the power of recalling them; 1 the patient understanding what is said to him, but not being able to reply verbally, because he is unable to call to mind the words which would express his thoughts. Such patients are exactly in the condition of the "Biologized" subject (§ 462), who, being assured that he cannot recollect his own name, finds himself absolutely unable to do so. But in other instances, it would seem as if the defect were not so much in the want of the memory of words, as in the want of power to express them. vocally ; and this, not from paralysis of the nerves of speech, but from an interruption to the action of the "Will on the motor centres (§ 312). And although there would seem strong ground for the belief that the memory of particular classes of ideas may be thus localized, yet it would be certainly premature to affirm that either the phenomena of disease, or the results of experiments, at present justify the belief that the region in question is the seat of the memory of words.The analogy afforded by the specialization 'of downward (motor) action, would lead us to anticipate that a like centralization may exist for upward (sensory) action ; and that particular parts of the convolutions may be the special centres of the classes of perceptional Ideas that are automatically called up by sense-impressions; and anatomical investigation, particularly in the lower animalsin which such ideas may be supposed to prevail almost to the exclusion of the intellectual ideas may not improbably throw light on this relation. But in regard to those Mental processes which mainly consist in the selection, classification, sagacity of Sir Astley Cooper enabled him to infer from an examination of the local circumstances, that the pistol must have been fired by a left-handed, man, the prisoner, -when called upon to plead and hold up his right hand, held up his left. 722 Appendix.Dr. Ferrier on the Brain. 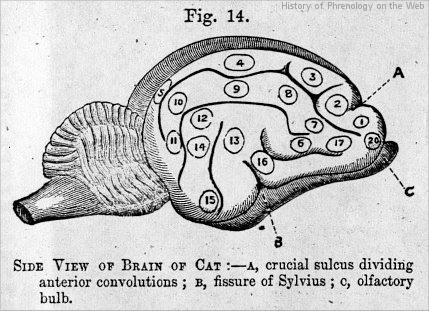 and comparison of distinct Ideas (§ 227), whether these processes be carried on volitionally or automatically, it still seems to the Writer just as absurd as it formerly did to suppose that there can be special " organs " for their performance, such as those named Comparison and Causality in the Phrenological system. * British and Foreign Medical Review, October, 1846.